Discuss Other Topics not related to the Paranormal or Conspiracies (within reason of course). ProfWag wrote: That's why I love you Ninja, you're not afraid to do a little homework yourself. Why thank you for the compliment. Yes, I prefer to give an interesting subject a 'spit and a promise', if and when I have some free time. ProfWag wrote: So getting back to my question, wouldn't that have to be explained as well? Let's say they did replace Paul with ol' Mr. Campbell. Wouldn't a family member out there, somewhere, be asking the same question "Where the hell did William go?" That is... if he has family or is even close to anyone. There are plenty of people who don't have living relatives and also don't necessarily have any social life to speak of. IMO, something of this nature is as hard to prove as any paranormal theories on this forum, especially with records from 1966. Not that it can't be solved in about ten minutes by science. I have often wondered why this sort of stuff isn't scientifically put to rest once and for all but hey, it sells records, so why kill the golden goose. Like it would be so hard to run some DNA and compare it to Paul's known relatives or easier still, run some fingerprints from (ancient) artifacts collected by fans in the early days. His guitars have got to be sitting somewhere in a museum or with high end collectors. Something as simple as an early autographed photo should yield a useable fingerprint. NinjaPuppy wrote: Like it would be so hard to run some DNA and compare it to Paul's known relatives or easier still, run some fingerprints from (ancient) artifacts collected by fans in the early days. His guitars have got to be sitting somewhere in a museum or with high end collectors. Something as simple as an early autographed photo should yield a useable fingerprint. Ah yes, using science to solve a conspiracy theory. Now why would we want to go and blow a perfectly good mystery by using science to solve it? William Campbell, AKA: Billy Shears has a listing on MySpace (http://www.myspace.com/53a177nvd/comments) that stopped activity in 2007. Perhaps there's a bigger conspiracy afoot? NinjaPuppy wrote: Oh, but there's MORRRRE! I think most people's myspace accounts stopped being active in 2007! Arouet wrote: I think most people's myspace accounts stopped being active in 2007! So! Then there is a bigger conspiracy going on here!!!! I knew it! I Googled. No big conspiracy. Dang! Ver interesting thread. Thanx everyone. What is the source of the photoes? The movie is still on Netflix. The "Official Site Homepage" describes it as a "mockumentary", tho. And "The Manchurian Candidate" was fiction. "What's so Funny about Peace, Love, and Understanding?" Twain Shakespeare wrote: Ver interesting thread. Thanx everyone. What is the source of the photos? I don't have a clue as to the source. I personally found some from 'fan' magazines that took up the story but where they got them from, I have NO idea. I've seen that mockumentary on Netflix as well, and while I like the story (only thing that makes the Beatles music interesting to me) the voice over that's supposed to be George is absolutely laughable! First off the guy's doing the worst accent impersonation, sounds like a Yank to me. Plus the voice doesn't sound anywhere near George's age, and supposedly it's being recorded on a Dictaphone style recorder to mini cassette from a hospital bed if I'm not mistaken. Yet there's no tape hiss in the audio, no room ambiance as you would expect in a sterile hospital room, no "hospital noises" in the background. Bloody thing sounds like it was recorded at Abbey Road. There are a few factual error's as well, I forget most of them but at one point "George" tries to imply that there was a teenage girl that stumbled upon the car wreck and therefore knew to much, and that girl turned out to be,.. Heather Mills,... except she would have been a young child in 1966. Or something like that, it's been well over a year since I watched it. Don't get me wrong I'm not discounting the whole story, just questioning some of the movies production values, still a good watch if you can get past those things. drastikmeazures wrote: I've seen that mockumentary on Netflix as well, and while I like the story (only thing that makes the Beatles music interesting to me) the voice over that's supposed to be George is absolutely laughable! Awwww crap! Now I'm going to have to watch it again. Some of the minor changes to voice and appearance you see are just due to normal ageing/maturation and change of hairstyle. You can't change his basic talent, singing and composing style that easily, nor personality and demeanour, nor would his family members go along with such a scam if it were even possible or feasible. We're talking about a pop group here. Last edited by SydneyPSIder on 18 Sep 2012, 10:19, edited 2 times in total. That is an excellent observation, theory, whateveryou call it. Check out this interview with James Fetzer and Clare Kuehn about 60's cults and the replacement of Paul McCartney in 1966. It's very fascinating and Clare knows a lot of stuff no one else does. "The bottom line to all of this is that by comparing photos Gabriella Carlesi has determined that the original James Paul McCartney born in 1942 has a different skull than the individual who has claimed to be Paul McCartney since 1967. Therefore they are different people. It's right there in black and white folks. Deal with it. No need to post vile garbage about me and Clare. Don't say we don't have any proof or any other BS. You have no proof that the individual claiming to be Paul McCartney today is in fact James Paul McCartney. If you have issues dealing with the truth then that's your problem. No need to shoot the messenger." Check this out. This DNA test may prove that Paul was replaced! Carlesi and Gavazzeni commented that if McCartney really wanted to put an end to these rumors, he could have offered to take a DNA test with his father or his younger brother, Mike, but he didn't. McCartney took a DNA test only once, but the authors of the article point out that the DNA test created more confusion and suspicion of his true identity, not less. In 1962, when the Beatles were living in Hamburg, Germany and still unknown to most people, Paul McCartney had a brief affair with a German woman named Erika Wohlers. She gave birth to a daughter, Bettina, in December 1962, which was during the time the Beatles were starting to become famous. The Beatles soon left Germany, and McCartney abandoned Erica. Around 1967 McCartney agreed to pay 30,000 deutsche marks to support Bettina, but he was not admitting to being her father, even though she claims her German birth certificate identifies him as her father! Once Bettina became an adult, she asked a German court to have McCartney recognize her as his natural daughter. McCartney had to submit to a DNA test, and the test showed that he was not her father. Interestingly, based on an autograph signed by McCartney, together with some photos taken for the occasion, Bettina accused the person who took that DNA test of being a substitute for Paul, not the real Paul McCartney! The autograph, for instance, was signed by somebody right-handed (Paul was left-handed). More information about this DNA test is here. Check this out. On the left is Paul McCartney after 1966 and on the right is him before 1966. Don't they look like two different people? Notice that the head size is vastly different too. 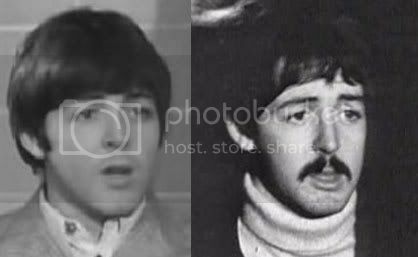 Also check out this comparison below of Paul five months apart in 1966. The left photo was taken in August 1966, and the right photo was taken in December 1966. How can Paul look so different in just five months? Doesn't his nose look longer as well? It looks like there might be something to this after all. Also check out these whole forums about the "Paul is dead" theory.